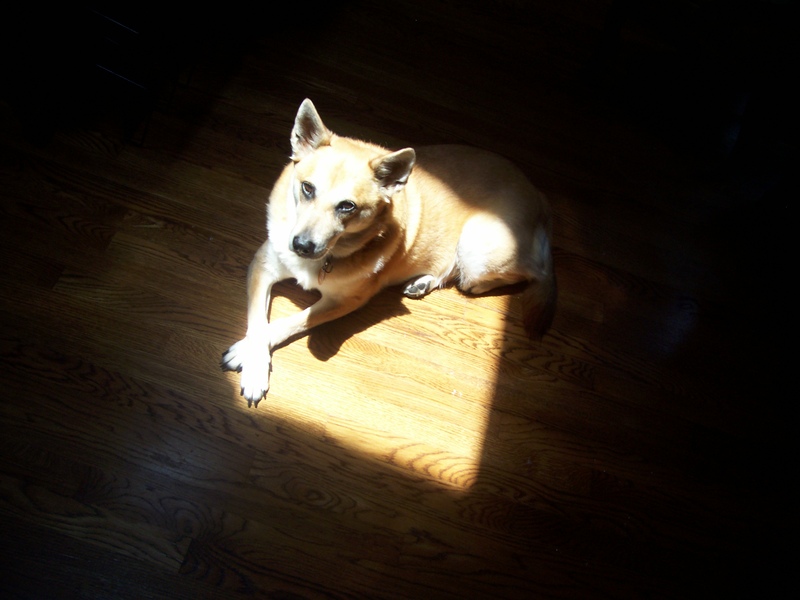 Rest in Peace, Sweet Quay Girl: In Which a Middle-Aged Goober Says Goodbye to Her Mutt – Amy Lyles Wilson, M.A., M.T.S. So I sat on the floor at the Animal Hospital of West Nashville on a rainy Thursday afternoon in February and rested my right hand on my dog’s shaved belly as she drew her last breath. I sang to her, yes I did. And I cried like a baby. The vet had reported that Quay had cancer in her liver, spleen, and adrenal glands. Big words were used, with scary sounding illness names. Such phrases as “palliative care” and “quality of life” were uttered. Hanging on to her, I think, would have been selfish, and unfair to that precious mutt. But my how I miss her already, a mere 15 hours later, this dog who kept me company on many a lonely night when I was single; who traveled with my husband and me to our honeymoon at the beach; who curled herself up tight on my friend Sheri’s chest the night I was 400 miles away at the bedside of my dying father. “She knew,” said Sheri, when I called to say my father was gone. Quay shed sitting still, and I suspect we will be vacuuming up remnants of her dog hair for months to come. Part of me will be glad for the remembrance, I suppose, but most of me will just be sad. She was known to lick anything that stood still, her spotted tongue flicking out with reckless abandon. She was a fine example of unabashed canine love, and I had forgotten how much it hurts to lose a four-legged friend. A lot. Quay’s heritage was unknown, the best guess being a mix of Lab, German Shepherd, and Chow. But her heart was never a mystery. The doorbell has just rung, and for the first time in 15 years, there is no barking, no mad dash of clicking nails across the hardwoods. Amy, this is lovely. I hope that your grief has lost some of its sharp edges by now, and that you can take some comfort in the love that the two of you shared. The love between humans and their animal companions is so pure that I believe it doesn’t dissipate, but continues to bless us long after the last hair has been vacuumed from the rug. You will always be Quay’s person. Thank you, Barbara. Quay was one fine dawg, and I’m glad I had her for as long as I did. It has been nearly a decade since we said goodbye to our Sadie. Some souls are just too intensly good to be forgotten. Thank you, TishaMarie, for sharing your Sadie with us here. I simply had forgotten how hard it is to lose a four-legged member of the family. There were childhood pets I loved, but there was something about Quay that will most likely linger forever. She was with me during some pivotal times in my life, and I treasure those memories of comfort and companionship she afforded me over the almost 15 years of her precious life. I still think of my “Little Bad Ziggy” every single day. She was 15 1/2 when she had to go 3 1/2 years ago. Through graduate school in Alabama, my first job in Arkansas and many years in Florida, we developed a pretty special bond. I love my babies that are with me now, but I will never forget my “Little Bad Ziggy.” Thanks for sharing. It’s amazing, really, how attached we become to animals. Thank you for sharing part of your story with me here. I’m so sorry. That’s all I can think to say. We just had to do the same thing with a sweet little cat that someone abandoned in our neighborhood a couple of years ago. We miss precious, little Isaac (My daughter has the habit of giving cats Biblical names!) and his sweet face greeting us as we go in and out the back door. Coincidentally, we had gotten my daughter a puppy for Christmas. He has truly become a member of our family, in just these few weeks. I can at least partially understand your loss. You just can’t help falling in love with your pets! They add a special dimension to our lives. We are reading The Call of the Wild in a small group of 3rd – 6th grade homeschoolers I work with on Fridays. We were talking just today about what a blessing animals are! Enjoy your sweet memories. Thank you, Connie. What a blessing these animals are to us, but I really had forgotten how hard it is to lose one. I suspect we will need to get another dog soon as this house is too quiet and lonely without something four-legged wandering around. I appreciate your sharing your story here with us. Lost my sweet 12+-year-old Baby kitty in June (on Father’s day, no less); I know exactly how you feel. It is heart-wrenching. We adopted a sweet brother/sister duo in October who’ve helped us heal. They aren’t replacements or rebounds — no animal will ever be her — but they sure have brought a lot of joy to us already. Sorry for your loss. Kim, I’m sorry for your loss as well. Thank you. And I know what you mean about getting other pets. There will never be another Quay Girl, but soon there must be another dog in this house. It’s too lonely without one! And I’m considering two this time around. I appreciate your sharing a bit of your story with us here. crying … she was so wonderful and thank you so much for sharing her with us. Thank you, Heather. Precious and I miss her terribly. The news of her cancer was a shock to us. Hope Morgan is doing well.